Donavan’s friends say he has a math block. They say no matter what he does or how hard he tries, he won’t understand until he has some sort of a math breakthrough. Donavan knows his friends are right, but he is annoyed they’re talking about his problems. Math isn’t Donavan’s only problem. His favorite uncle, Victor Carter, has returned from war, not the same as when he left. He’s in a wheelchair, having lost both his legs when his tank got blown up. Before heading off to war with his National Guard unit, Uncle Vic had been a firefighter. And quite the basketball player, too. He balled like he belonged in the NFL. He’d also been quite a dancer, having taught Donavan and his little sister, Nikki, to dance the cabbage patch. Donavan isn’t sure how to react to his uncle’s disability, and the thought of artificial legs freak him out. for Uncle Vic? Might they be disappointed? Might they stare? Donavan doesn’t want to take chances, so when his grandma gives him a note, to give to his principle, asking if Uncle Vic could display his carvings during Heritage Month, Donavan conveniently kept the note to himself. One afternoon when Donavan visits his uncle, he finds him sprawled out on the floor, having fallen out of his wheel chair. Alone with no one else to help, Donavan is forced to face his fear of his uncle’s disability. “I’ve got to do it,” he thought. Uncle and nephew begin to spend more time together, and they talk. And what Donavan discovers is that he isn’t the only person feeling uncomfortable about Uncle Vic’s disability: Uncle Vic is too. In the end, both learn to overcome their fears and difficult problems by making a plan and facing problems head on. lying on the floor I imagined myself in his same situation. In that scene, Donavan had to untangle Uncle Vic’s artificial legs, and then detach them from metal cups that held them to the stump of his leg. I’m an adult, and that would creep me out. I liked that the author also gave readers insight into Uncle Vic’s feelings of insecurity in dealing with his disability. 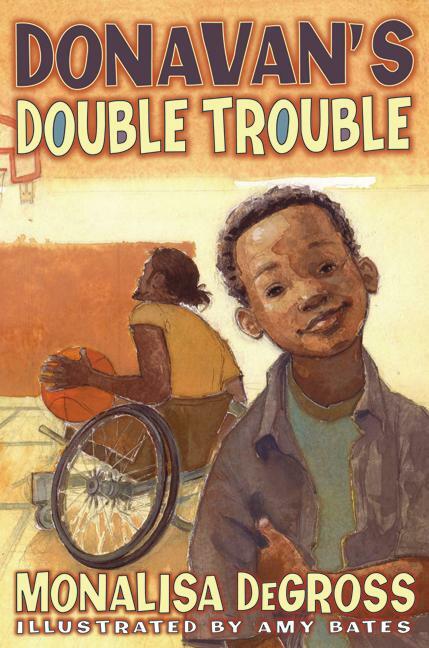 Donavan’s Double Trouble is Monalisa DeGross’s follow-up to Donavan’s Word Jar. Are you a librarian? Or other interested party in support of African American children’s literature? I’ll send you a free copy of Donavan’s Double Trouble. Send me an email or post a comment here. And come the end of the week, I’ll select a couple folk.